This invaluable “mentor in your pocket” by three dynamic and successful black female executives will help all black women, at any level of their careers, play the power game—and win. 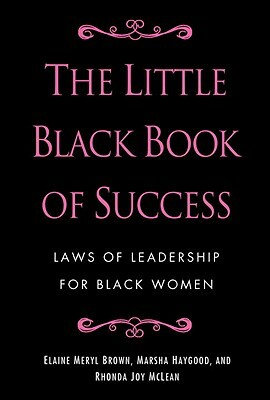 Rich with wisdom, this practical gem focuses on the building blocks of true leadership—self-confidence, effective communication, collaboration, and courage—while dealing specifically with stereotypes (avoid the Mammy Trap, and don’t become the Angry Black Woman) and the perils of self-victimization (don’t assume that every challenge occurs because you are black or female). Some leaders are born, but most leaders are made—and The Little Black Book of Success will show you how to make it to the top, one step at a time. Elaine Meryl Brown is vice president, special markets and Cinemax Group, at HBO. Prior to joining HBO, she was a creative director at Showtime Networks. An Emmy Award–winning writer and the author of the novels Lemon City and Playing by the Rules, she is currently writing a young adult fiction series. She lives in New Jersey. Marsha Haygood is the president and founder of StepWise Associates, LLC, a career and personal development consultancy. She was formerly the executive vice president of human resources and administration at New Line Cinema and Orion Pictures. She lives in New York and Florida. Rhonda Joy McLean is deputy general counsel of Time Inc. and the former assistant regional director of the Northeast Region of the Federal Trade Commission. She has worked as a corporate litigator in a major New York law firm and taught administrative law at the City University of New York. She lives in New York City.